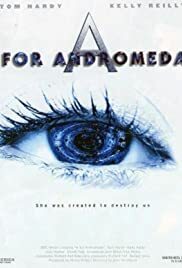 A For Andromedia has a great story and good script, it is a work of intelligent science fiction. Science Fiction fans will have no problem getting through this work. The movie itself suffers for its low budget. The story needed to be projected forward in time. It's premise is on much safer ground in today's computing world than 2006, and would be even safer years from now. The movie needed a budget that reflected that. It comes across as a sort of play (or at least it did for me) which required my imagination and understanding to make it work. Face it, it's an intriguing idea for a movie. Working really hard are the cast, which is appreciated. One also has to appreciate the BBC, whom in this project, put their faith in cerebral sci fi. It certainly works, but could have had a better visual dimension, and if this story ever does, I'll certainly sign up for the reboot.